U.S.A.F. Major General David. D. Thompson, Vice Commander, Air Force Space Command. A year later, Hyten runs Space Command. Thompson answers directly to him and brings not only an understanding of all of those service needs, but a resumé that includes doing something about improving SSA from his former job as Plans and Operations chief (J-5) with US Strategic Command. In January, Thompson signed a technical agreement wherein Germany joined with the United Kingdom, South Korea, France, Canada, Italy, Japan and Australia, as well as the European Space Agency, the European Organization for the Exploitation of Meteorological Satellites and 46 commercial entities in 16 countries, to share data to enhance multinational space cooperation. 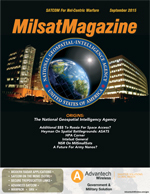 A month later, General Thompson accompanied STRATCOM commander Admiral Cecil Haney to Intelsat General headquarters in McLean, Virginia, to discuss data sharing between military and commercial satellite operators, and to work on establishing an integrated commercial and government SATCOM architecture. Acknowledging that the use of space is becoming more competitive and congested, Thompson is acutely aware of the growing problem of space debris that threatens free use of that 73 trillion cubic miles the Air Force is responsible for monitoring. This is an area of concern for commercial satellite operators, as well as the military. Perhaps more to the point, it’s an area of concern for everyone. Those concerns are why the Joint Functional Component Command for Space tracks more than 17,000 objects in space, about 1,100 of which are active satellites. The debris is added to continually. When the Chinese tested an anti-satellite weapon in 2007, 1,500 more objects were created instantly. And when an inoperable Russian spacecraft collided with the Iridium 33 communications satellite in 2009, STRATCOM took on the role of monitoring the debris and warning others when their satellites were threatened. 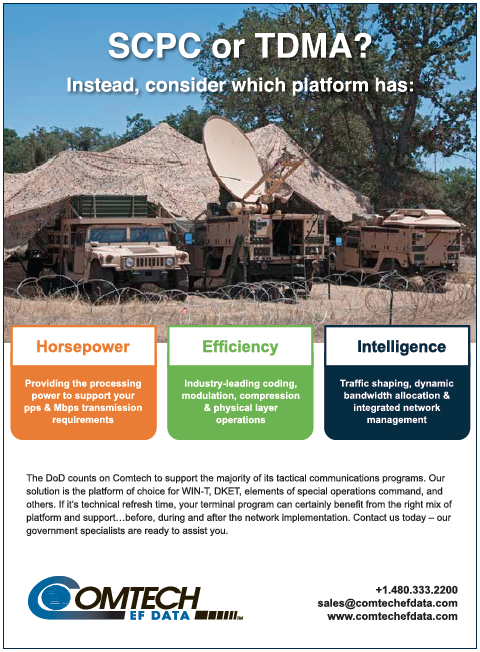 The warning capability recently became enhanced when an organization of six commercial satellite operators—including Intelsat—stood up to work alongside military personnel at the Joint Space Operations Center at Vandenberg Air Force Base on a six-month trial. General Thompson is acutely aware of how the debris problem impacts SSA. It’s just part of his perspective about the area in which he works. This is an understanding he brings to his new job, gleaned from years of working with satellites and the people who operate them.